Benjamin F. McAdoo was born in Pasadena, California in 1920. He established the first African American-owned architecture firm in Seattle and was the first black man to practice architecture in Washington State. He was a local community leader and advocate for the advancement of low-income resident housing solutions. McAdoo completed his bachelor’s degree in architecture at the University of Washington. Working nights and attending daytime classes, he graduated in 1946. His projects were first published in The Seattle Times in July 1949. McAdoo’s first commissions were small in scale, including community churches, building renovations, and private residences, but private homes brought McAdoo popular recognition. 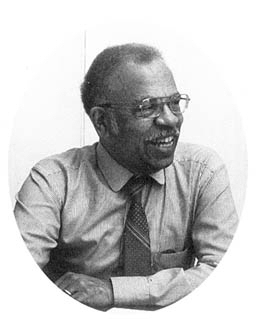 McAdoo’s designed modular housing in Jamaica for the United States Agency for International Development and during the three decades of his prolific and diverse architectural career, McAdoo designed churches, single and multifamily dwellings, as well as commercial and institutional works. He exercised a design style of modernism and regionalism. Like many other architects, McAdoo’s personal residence (1957-1958) is a premier example of his ideal residential design process. At 17803 28th Avenue South in Bothell, McAdoo’s house illustrates his approach to Northwest regionalism. Other residences designed by McAdoo populate central and north Seattle. Later in his career, his designs and renovations included work for the University of Washington, the King County Central Blood Bank, Seattle First National Bank, and the City of Seattle. McAdoo clearly demonstrated his interest in the Seattle black community. In 1964 and, as president of the Seattle chapter of the NAACP, began broadcasting a weekly radio show focused on social issues. He maintained this post for four years. McAdoo worked steadily until his death in 1981. His career, spanning critical decades of the civil rights movement, seamlessly joined social imperatives with architectural design. Jeffrey Karl Ochsner, ed., Shaping Seattle Architecture: A Historical Guide to the Architects (Seattle: University of Washington Press, 1994), 264-269; and HistoryLink.org Essay 1161 By Heather MacIntosh, October 30, 1998.